There will be lots of tech talk in this week's episode of "Axios on HBO," including my interview (with Mike Allen) of Apple CEO Tim Cook. It airs at 6:30pm ET/PT. And we'll have more from the Cook interview in Monday's Login. While Facebook was defending itself in its latest hurricane of controversy, it also unveiled new plans to retool and improve the way it handles problematic content and user complaints. Driving the news: In a novel move, CEO Mark Zuckerberg announced that beginning in 2019 the company would experiment with forming an independent body that will serve as a kind of court of appeals for users who disagree with decisions Facebook has made about removing (or permitting) content on its platform. "I have come to believe that we shouldn't be making so many important decisions about free expression and safety on our own," Zuckerberg told reporters. Facebook hasn't determined how this "oversight body" would be chosen or how it would function. The new group would serve as the last stop in a more extensive appeals process that would provide users with a clearer and more transparent means of challenging the company's content-moderation decisions. Reality check: This is fraught territory. Facebook can shift responsibility elsewhere, but whoever it appoints as its judiciary will come under its own scrutiny, either for being not independent enough or being too powerful. And some say the company is just passing the buck, making lots of money while avoiding the tough calls. That said, people want someone to make the tough calls and a panel of experts seems to be a reasonable approach. Down-ranking sensationalism: Zuckerberg also said that Facebook would begin to penalize content that doesn't violate its rules but comes close. Right now, he said, the more "sensational and provocative" content is, the better play it gets in Facebook's News Feed rankings. "We want to ensure that borderline content gets less distribution and not more," he said. "We don't want to ban it, because it doesn't cross the line, but we want less of that stuff in the network." Our thought bubble: Good. We've been saying for a while now that Facebook and Twitter have the power to do this and should. They use their algorithms to prioritize all kinds of things. It's time to use some of that energy toward making sure that marginal posts, near-hate speech and other content isn't amplified. There are lots of things Facebook and Twitter can do short of banning content. Heck, they could make a start just by not promoting such content as trending posts. Yes, but: The more Facebook and Twitter fiddles with the dials, the more likely it is that people will accuse it of putting its hand on partisan scales, with so-called "shadow-banning." We say bring it on. Facebook and Twitter aren't required to give equal weight to all posts — they already don't — and if they really believe in healthy conversations they need to act more decisively to create the environment they seek. 2. 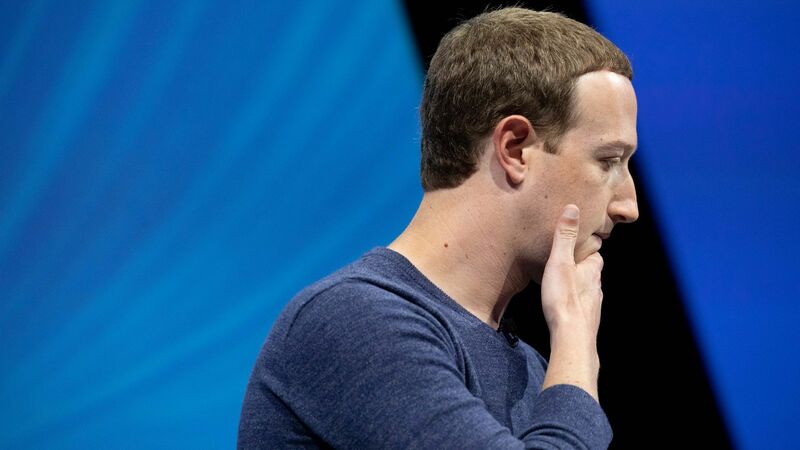 Facebook execs: "We didn't know"
Zuckerberg and COO Sheryl Sandberg have an interesting defense to the company's involvement with a D.C.-based opposition research firm that had tried to link an anti-Facebook campaign to billionaire philanthropist George Soros. We had no idea, say both top executives, Axios' Sara Fischer reports. Background: Definers Public Affairs is a consulting firm founded by former Republican campaign staffers that specializes in opposition research. It has done a bunch of work against Apple, seemingly at the behest of both Facebook and Qualcomm. Who knew? On a call with reporters Thursday, Zuckerberg said he learned about the relationship via the New York Times piece that was published Wednesday, and quickly decided to end it. Zuckerberg said that Sandberg "was also not involved" with the Definers relationship, and that "she learned about it at the same time I did." Also, opposition research like this has become standard operating procedure for many big companies. It's possible executives overlooked the relationship until the NYT story spotlighted its press materials around Soros, whose longstanding role as a target for right-wing conspiracy theories has grown even bigger in the Trump era. 3. Scoop: Funding "Freedom from Facebook"
A Pennsylvania philanthropist and former hedge fund executive named David Magerman was the initial donor behind a high-profile campaign urging regulators to break up Facebook, he confirmed to Axios' David McCabe for the first time on Thursday. Why it matters: Magerman has given more than $400,000 to the campaign, called "Freedom from Facebook," because he believes Facebook has too much power over how the world communicates. This was the campaign that Definers had tried to link to billionaire philanthropist George Soros, as mentioned in the story above. “By combining social media, news distribution, advertising, commerce, and business and political networking, it forces people to engage in its platform, even if they only want one of its offerings,” he said, comparing Facebook’s algorithms to “telescreens” from the novel "1984" that both record people and show them content. Go deeper: Read David's full scoop. John Skipper, who resigned as head of ESPN late last year, is back and looking to build a new global sports media giant. What's new: On Wednesday, his company, DAZN, announced a deal with Major League Baseball that will allow it to show live look-ins throughout its prime-time programming in the U.S. Yes, but: In trying to compete in the U.S., Skipper not only needs to compete against ESPN's many cable channels, but also its ESPN+ over-the-top service and other big league sports services. And when it comes to bidding rights, the company will have to contend with ESPN, the big networks and more. "Change can be a good thing however inelegantly it may occur," he said. "I happen to be very happy where I am working. I am very happy with my personal life." Election Day traffic to national news sites saw four times the visits compared to an average day in October 2018, Axios' Marisa Fernandez reports, citing fresh data from Adobe Analytics. The big picture: The spike in Election Day-related traffic and engagement mirrored what proved to be the highest percentage of U.S. midterm-election voter turnout since 1914, per WSJ. By the numbers: Adobe analyzed 400 national news sites and over 150 billion visits and app launches, then compared traffic to an average day for October 2018. National news sites saw 5 times as many visitors between 6pm and midnight ET on Election Day. People took more time to digest the details — 4 times longer than on a regular day in October. States with the closest races drove the most traffic to news sites: Georgia, Virginia, New York, Arizona, Florida and Texas. Adobe saw 20% of traffic coming from outside the U.S. on Election Day and the day after. News dumps. Not sure what, but surely there will be some as it is not only a Friday but the Friday before Thanksgiving week. Bad air, at least in Silicon Valley, where schools in San Francisco and many Bay Area cities are closed due to heavy smoke from the wildfires. Uber promoted Manik Gupta to chief product officer. He had been VP of maps and marketplace. As Recode first reported, Facebook general counsel Colin Stretch, who was due to leave the company this year, will now stay into 2019 given all the company has going on at the moment. Miles Scott, aka Batkid, who captured San Francisco's heart a few years back, is cancer-free.